The Problem: Children with autism and/or fragile X syndrome have trouble expressing their emotions. 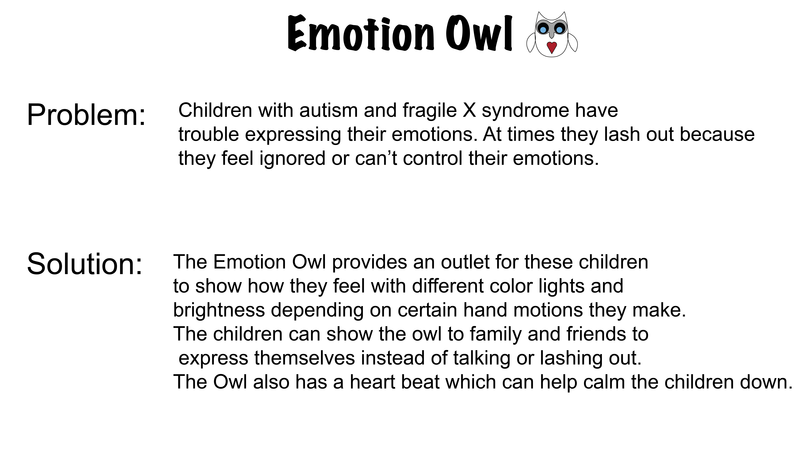 The Solution: The Emotion Owl provides an outlet for these children to show how they feel with different color lights and brightness depending on certain hand motions they make. Detailed Solution: The children can show the owl to family and friends to express themselves instead of talking or lashing out. The Owl also has a heart beat which can help calm the children down. Despite drawing being very important in children’s development and very important to many adults, many do not have the ability to draw due to a lack of fine motor control and other issues. The solution to this problem is a simple device that allows a pencil to be controlled with large, imprecise movements. A Myo can be used to control a drawing device with simple and easy movements. DrawingBot makes drawing easy for people who lack the simple skills needed to draw by helping people create art without actually having to hold or precisely control the pencil. The final iteration of the project uses servo motors to move a pencil connected to the servos through multiple joints. The servos are controlled by a Myo. The drawing device was originally controlled by a timing belt and then a gear and rack until we reached our final idea which we prototyped many times. Though mostly complete, the servos movements must be corrected as well as the control system for the device. The Problem: Children with autism and fragile X syndrome have trouble expressing their emotions. Main Story or Theme: Kids with fragile X syndrome can lash out when they are scared or angry because they can’t control their emotions or they are not getting enough attention. This can become more dangerous as they get stronger. Also some children with autism don’t feel comfortable sharing their emotions directly. We wanted to create a way for the children to express themselves calmly and get the satisfaction of being heard and recognized. 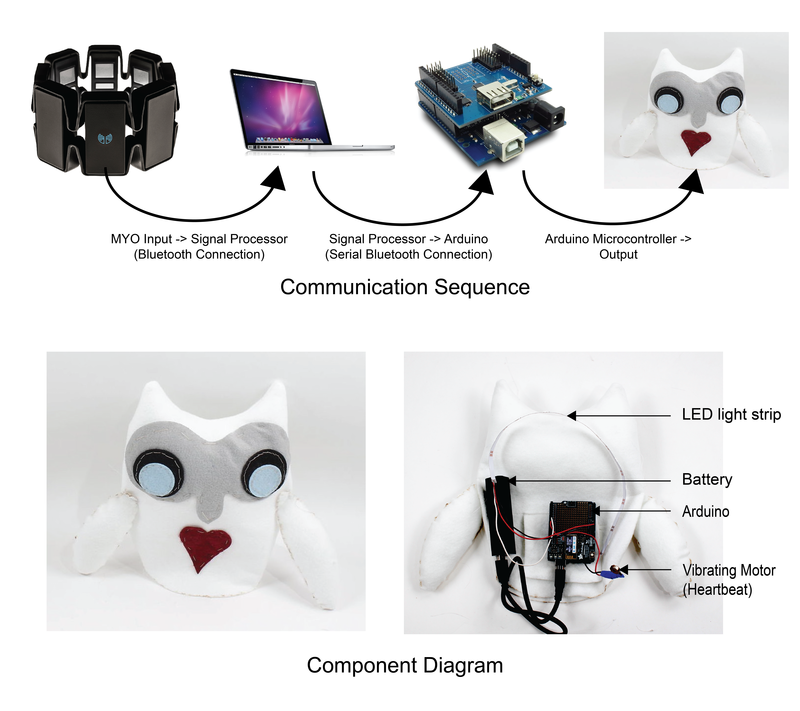 Mechanics: The Emotion Owl has ten LED lights in it that light up five different colors corresponding to hand gestures read by the MYO. A fist means you are angry and turns the light red. If your fingers are spread, you are disgusted turning the light green. Waving your hand in means that you are sad turning the light blue whereas turning your hand out means you are happy turning the light yellow. The last gesture is double tapping meaning you are afraid turning the light purple. There is also a steady heart beat to relax the child made by a vibrating motor. Development: We started out by thinking of different ways to help children express their emotions. We had an idea of a dog stuffed animal, race cars that light up, owl stuffed animal, and a game. We decided to build the owl and we incorporated LED lights and vibration. The owl is both used to express emotion and comfort the child. Challenges: We faced various challenges throughout our project. We had lots of trouble with the sewing machine, getting the right materials and also needed help with programming. There was various technical difficulties involving the LED lights and also the MYO device was very difficult to sync up with different peoples arms and also to the computer. Our first iteration was a small stuffed owl with a blue beak and a big red heart. We had five LED lights that lite up if you pressed a button and the brightness was controlled by a potentiometer. In our second iteration we updated the owl design and added a vibrating motor to simulate a heartbeat. We added a small hole behind the sewn heart for the motor to go. We also added a flap in the back to put the arduino in. For this iteration we used the MYO to control the LED lights instead of the button and potentiometer. Our first iteration was a simple x and y axis drawing machine composed of tape and cardboard. The horizontal bar was moved vertically by a motor and a belt made out of tape. The pencil was moved horizontally by a motor and belt. The belts were attached to both the horizontal and vertical bar. After building this prototype, we saw that this idea used too many motors and was unstable. We decided we should continue on the idea but make critical changes to make in more stable. Our second iteration was similar to the first but we redesigned how the motors would be mounted on the device. Instead of hanging on the outside, the motors were mounted inside of the horizontal and vertical bar. This proved more stable but the belt still had flaws when moving and holding the pencil. Along with this, the wires connecting the motors to the Arduino still had no place to stay and would have to be on the outside of the device. We also had yet to make a stable pencil holder. Our third iteration changed a lot from our first two. This iteration had two servos controlling an arm between them. This iteration took up less space and therefore it was significantly easier to see the drawing. This iteration also eliminated the problem of syncing up the motors. We also could easily hide the wires within a box on which the arm was mounted on. This iteration had some problems that needed to be fixed in the next iteration for example it did not have a pencil holder and the arm was bent upwards. Our final iteration was similar to our third. We still used an arm between two servos, but we added spacers so the arm was not bent and the iteration had a 3D printed pencil holder. These changes made the arm more stable and move more smoothly. We also made the box the arm was mounted on bigger so the user could draw with the full capacity of the arm. Today we learned how to use the myo device and use it to make a light light up. Then, Libby and I started to work on the box for our final product. We decided to make it similar to the prototype by having two compartments, one for the lights and underneath that a space for the wires. Although, this time we won't have the potentiometers, so we wont need an extra space in the box to put those in. In addition, we decided that instead of notching all the parts we're going to put support boxes inside the box so that we can just place the pieces needed instead of notching them into place. We started to laser print but ran out of time at the end of the day so tomorrow we will continue to cut out the pieces and put it together and finish the light board. I like the idea of support boxes! Nice approach. Today Libby and I finished up the box for the lightboard prototype. After cutting the wood part of it and trying to put it together we thought one piece's notches were off but after reprinting that piece we realized that we had originally put the box together wrong and the first piece we cut actually was right. We also realized after cutting initially that we had drawn the acrylic wrong on rhino and made it from the inside of the box and not the outside corners. Luckily we realized this before cutting the acrylic. Once we cut the acrylic we realized that when we redrew it we forgot to add holes for the potentiometers, so we went back to the laser cutter and drew 2 holes and moved the acrylic so they would be cut in the general areas we wanted them in. Then, we put the lights and wiring on the box and began to put it together. Tomorrow we will start our final product. Today we built our prototype for our light board. Keziah created the box on Rhino and then printed it. On fusion I created the two knobs that will go on the lightboard and control the lights, which is similar to an etch it sketch. Jess finished up the code for the LED lights and started to assemble it in the box. We then printed the acrylic shield that will go on top of the box. Tommorow we will start the final product. Adaptive Myo Devices will introduce you to the world of adaptive design with a cutting edge technological twist. Adaptive Design seeks to ensure that people with disabilities receive the custom adaptations they need to fulfill their developmental, social, academic, and vocational potential. 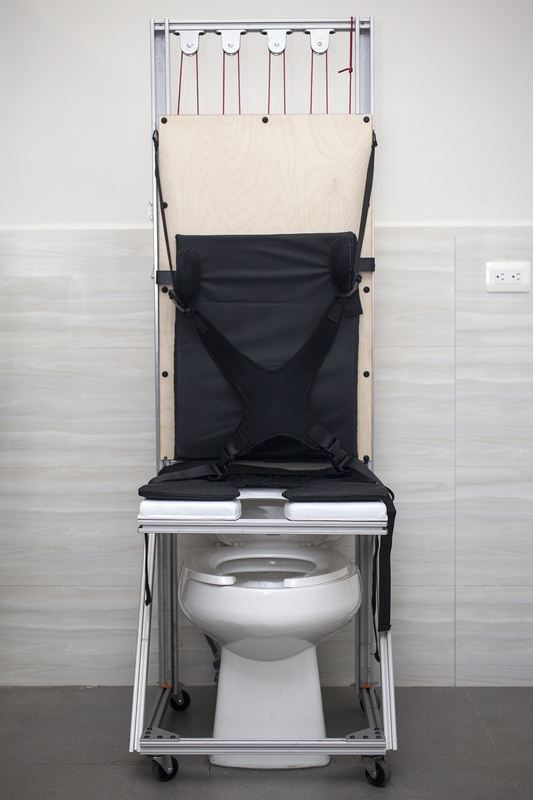 Students will create assistive hardware that is responsive to the movements of the human body. To do this we will employ the Myo armband which uses proprietary EMG sensors, the to measures electrical activity from your muscles to detect gestrures, motion, orientation and rotation of your forearm. This will be a challenging, though rewarding, studio in which we will learn the basics of electronics and arduino, 3D modeling and fabricate design prototypes, integrate the Myo technology, and generate open-sourced designs for dissemination. 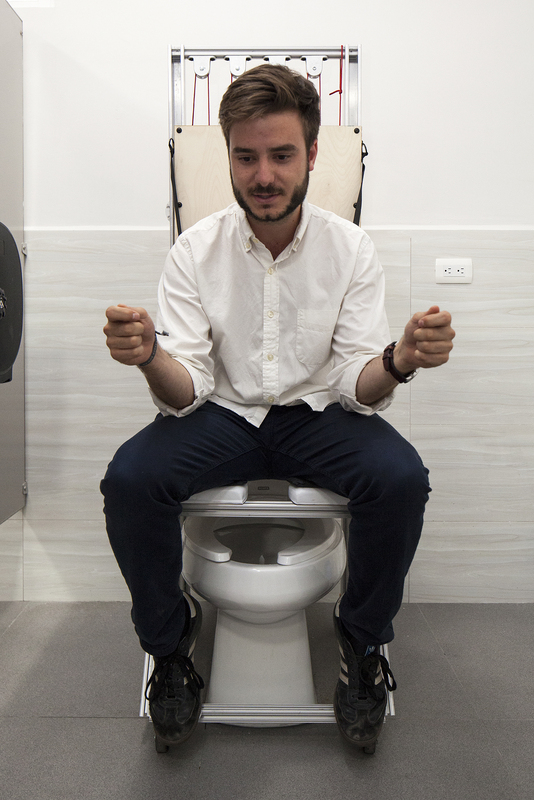 This studio is part of the NuVu Lab for Assistive Technology, a research initiative to develop technology and design solution for a variety of humanistic needs.